Devotion to Our Lady of Good Success began in Madrid about the time of the 16th century. While on a journey to Rome, two Brothers from the Order of Saint Francis of Paola (also known as the Brothers Minor for the Service of Sick) were caught unexpectedly in a terrible storm. They sought refuge in a cave, where they discovered a miraculous statue of Our Blessed Lady cradling the Christ Child on her left arm and holding a scepter in her right hand. On her head was a crown of precious metals and jewels. The Brothers transported the statue to Rome and informed the Pope of the miraculous discovery. The Pope placed the Order under the special protection of the Virgin, to whom he gave the title of Our Lady of Good Success. The statue was then removed to the Royal Hospital of Madrid and finally enshrined in the magnificent Sanctuary of the Puerta del Sol (Door of the Sun), a splendid cathedral commissioned by Philip III in 1641 specifically to house the statue of Our Lady of Good Success. Devotion to the Virgin of Good Success grew rapidly throughout the country. The cloistered Conceptionist sisters of the convent of the Immaculate Conception in Quito, Ecuador had an especially fervent love for the avocation of Good Success. before the humble Sister's eyes, with the title of Our Lady of Good Success and that this statue be placed for all time above the chair of the Abbesses who would succeed Mother Mariana. Our Lady announced that she would, as the principal Abbess, preside over this community which she had adopted as her own. Mother Mariana was uncertain how she would reproduce the statue in majesty, size and proportion in wood. 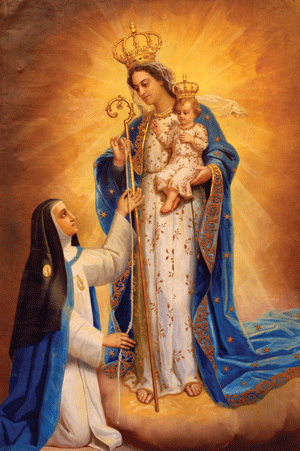 In response, Our Lady told her to remove her cincture (a corded rope worn around the waist of a habit), and taking one end of it, Our Lady assisted Mother Mariana in measuring the Virgin's height. She then instructed Mother Mariana to have a statue made in proportion to the height, and place in her right hand a crozier rather than a scepter. This the sister commissioned to be built, as our Lady had instructed, and had the statue set up in a place of prestige above the chair of the Abbess. Devotion to Our Lady of Good Success has spread throughout the entire world, and many communities, churches, families, and individuals have taken the Virgin as their special patron and intercessor. Those who invoke her under the title of Good Success have never failed to experience her help and guidance. OUR LADY OF BUEN SUCESO OF THE PURIFICATION, PRAY FOR US!